Another Beautiful Day in Paradise. The sky was a little over cast, the temperature in the high 70s/low 80s and we had a breeze out of the SE. 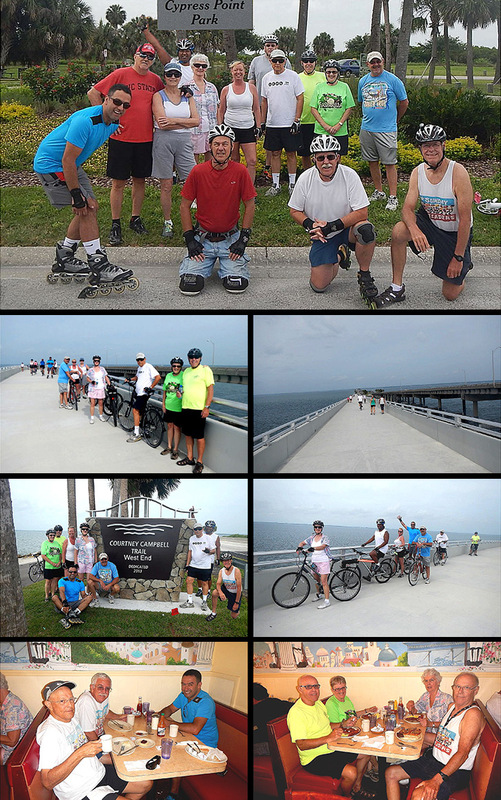 Bladers/Bicyclers Carlos S, Rick P, Ginnie S, Breeze, Carol J, Laura P, Nick S, Steve G, Jim & Wilma F, Rob H, Jeff B, Dee T and Bruce M came. Welcome all. With the breeze at our backs heading West some of us decided to go to the West end of the Courtney Campbell Causeway Trail. This was a great idea going West but it about killed us coming back East against the wind. We had a group that did 12 miles, a group that did 14 miles and the group going to the West end did 15.5 miles round trip. We had 11 bicyclers and 3 bladers. We decided to eat at the Village Inn instead of Athens restaurant. However when we got to the Village Inn it was packed and the waiting was too long for us. Well, what the heck, we headed to the Athens restaurant. We got right in and seated at the Athens restaurant but we lost several people in the process. The service was pretty good, we got a couple cups of coffee and the food was very good. We gave Athens a 9.5.